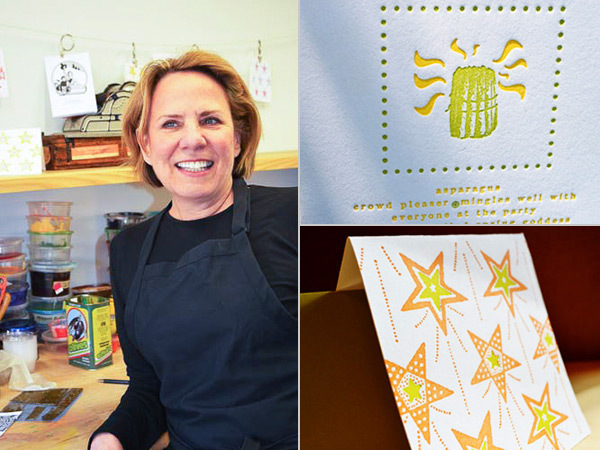 Armed with sharpies, inks, and a dazzling inspiration, Katie Daniels of Concrete Lace is a phenomenal front to shaping the way letterpress has been deftly handling those warm wishes and special greetings to friend and family alike, be it a an eye-popping invitation or a special run edition card. A Georgia native, Katie’s been imbibing the wonderfully sweet fruits of the creative process. 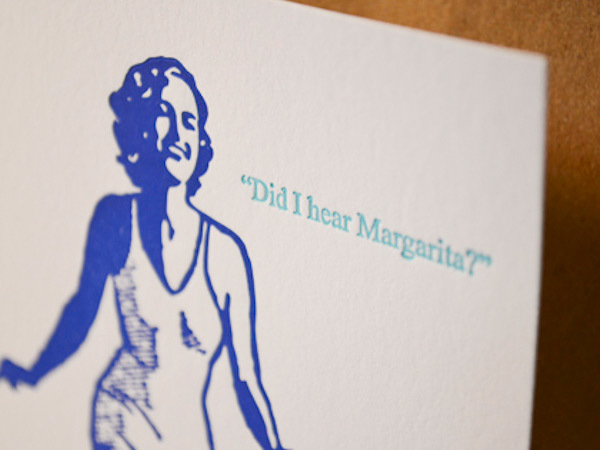 If you’re in the Asheville, North Carolina area between August 2nd-5th, you should pop in to the Ladies of Letterpress Conference and say a big hello to Katie, as she’ll be rousing up some fun at the printer’s fair! IT’S ALL IN THE CARDS I am originally from Foley, Alabama, on the Gulf Coast of Alabama (a sleepy town that didn’t know what to do with a rebellious punk vegan in the early 90’s). My mother is very creative, always had art supplies around and is no doubt the reason why I am an artist today. As a four-year-old, she encouraged me to start selling my handmade cards annually at the Foley “Art In The Park”event. 30 years later, after moving to Atlanta, the card making tradition continues under the name my awesome sister, Carla Kaiser, came up with: Concrete Lace. I also love history, collecting, cooking, exploring, gardening, animals and being a nerd. LETTERPRESS FOR LIFE I had dabbled in printmaking in the past, but when I got engaged in 2008, I really wanted to print my own invitations. 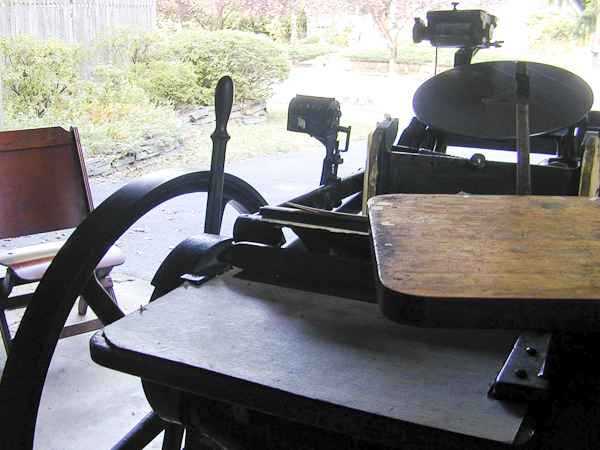 A friend of mine told me about a local company, Praxium Press, who let you rent their press. 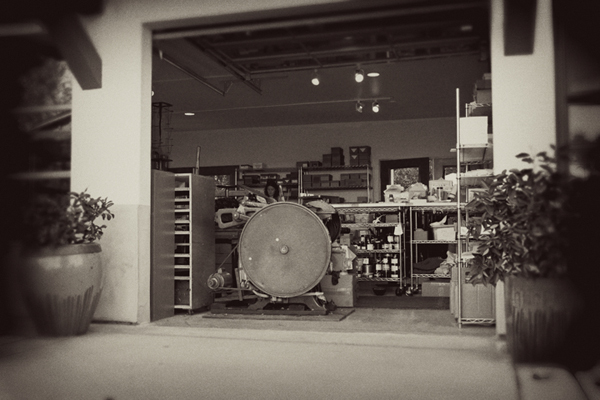 The owner, Berwyn, was an awesome guy who introduced me to the Vandercook world. 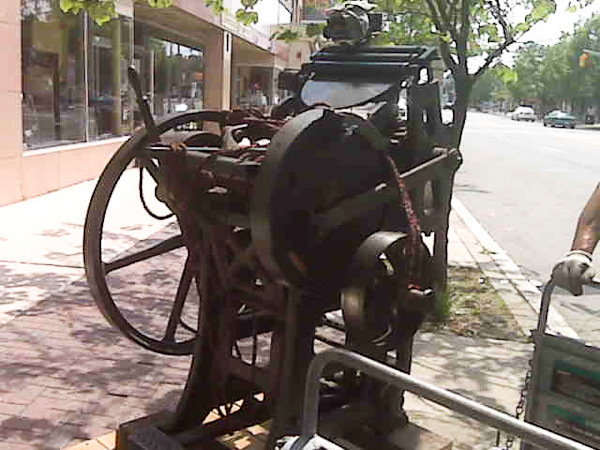 I loved it and immediately started designing & printing letterpress greeting cards and Atlanta neighborhood postcards, and was printing there so often that he convinced me it was time to get my own press. My awesome husband, Paul, then decided to set me up with a Vandercook studio in our home where Concrete Lace is thriving today. GIFTED IN GEORGIA My studio is in my home, with the Vandercook & Kelsey upstairs in the small 7×10″ studio, and the Kluge, C&P and large format Challenge cutter down in the one-car garage. My upstairs studio is an inspirational eclectic mess, and the garage is more industrial feeling. I love to crank up local tunes super loud when I am printing, and I like to let the music set the tone for my productivity. LIFE LESSONS + PRINTING MENTORS I had a fortunate job at one of the best health food stores, Brighter Day in Savannah, Georgia, while in college. I worked there for many years, and befriended a dear woman who also worked there, the late Joan Cobitz. Joan was among the first female MFA printmaking graduates of her time. She served as a major inspiration to me, as we traded house cleaning expeditions for printmaking classes in her home studio (printmaking was not offered at SCAD at the time). She was a great story teller and mentor for me and I think of her daily, not only in the press room, but also when I use her culinary advice or her prized Sabatier kitchen knife. After graduating, I moved to Atlanta, and was fortunate enough to buy a house next door to a fourth generation letterpress printer, David Brough. He was a kind and generous man who loved his presses and loved to share information. Through David’s passing, I met another printer, Kevin O’Neil, who serves as my primary letterpress mentor today. Kevin very generously donated a beautiful C&P and Kluge to my pressroom, along with his invaluable information, which I will cherish forever. DAILY GRIND For illustrations and hand lettering, I start out either with sharpies or pen and ink, then scan them in and convert them to vector graphics in Illustrator. Some illustrations are done directly on the computer in Illustrator (sometimes Photoshop then Illustrator), but I do all of my layouts, typesetting and separations in InDesign. My designing system is different for each line of cards as I like to switch things up so that I am always exploring new things. For example, I did a great deal of research on tapestries, pottery, wall paintings and other historic references when coming up with designs for my Greek and Hebrew lines, but did more hand lettering and illustration for my pet sitter cards, and illustration & typesetting for my French and German series. THE DESIGNER IN THE PRINTER I am a professionally trained graphic designer, as well as a printer. FULL TIME FUN I am a full time designer and a “part time” printer (but more like a 2nd full time job). I will never stop designing, so it is not my goal to give that up. I love it too much! A LUCKY FIND I looked a year for a Vandercook SP15 or #4 (the only two sizes that would fit in my tiny upstairs studio), but no luck until I got Steve Robinson involved. He found me a #4 from an ink testing studio, and the press was in beautiful condition, with minimal miles logged and only one owner! A VARIETY OF ACCOMPLISHMENTS I have won the Redbull Flugtag competition twice, thousands of dollars in numerous halloween costume contests, fostered and placed over 30 dogs, donated eggs twice, taught myself how to proficiently speak German in three years, forgot how to speak German in three months, taught myself how to play the accordion, started piano lessons at age 23, started tap lessons at age 31, won several design awards for work done for Emmy awards packaging and work created for television networks TNT, TBS and Turner Classic Movies, and most importantly, started Concrete Lace. BOXCAR’S ROLE Boxcar sold me my base for my Vandercook and my Kelsey press, and I have been ordering my plates from Boxcar ever since. I really do find value in the relationships I have established with Boxcar, and feel that they have set a high industry standard, and high expectations, for customer service and plate making. They are fast and their site is user-friendly — key reasons for why I use them. SHOP TIPS Don’t be discouraged. 1) This industry is all about exploring and learning, so I feel like even the biggest mistakes are the best teachers. 2) These machines were around WAY before any of us, and WAY before computers. We sometimes need to back off and not put pressure on ourselves to meet today’s standards of timing. These machines are much more powerful than we are, so it’s so important to think clearly and work at a pace that is comfortable for each of us individually. WHAT’S NEXT I am working on an Italian line, and have two more lines in the works that will have to be a surprise… They probably won’t be ready until 2013, at this rate! Big round of thanks out to Katie for letting us take a peek around the shop at Concrete Lace! 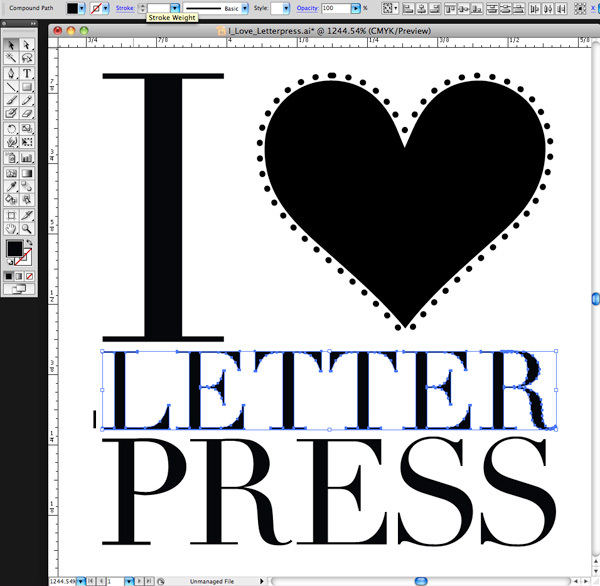 Don’t forget to say “Hi!” to her at the Ladies of Letterpress Conference on August 2nd-5th, 2012! Take a large helping of letterpress love, add a smidgen of luck when finding the perfect press, pour in slowly more than a few cups of excellent design experience, add an enchanting creative streak, and you’ve got the divine recipe behind Paprika letterpress + design. Lenor Mirochna lets us in on the flavorful story behind the letterpress and design studio powerhouse. Read on to get the full scoop. 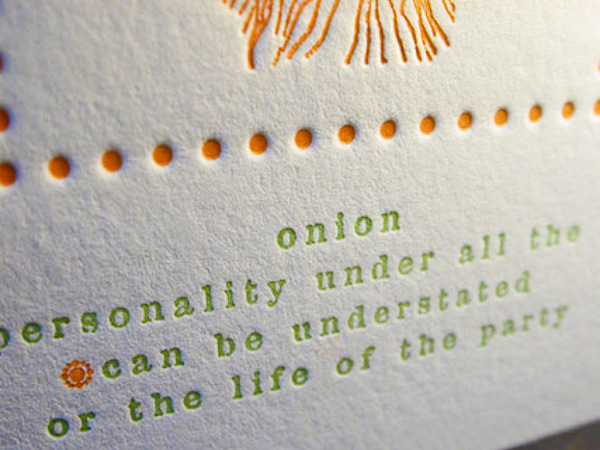 SPICING UP LETTERPRESS Paprika letterpress + design has been an adventure since day one with a serendipitous beginning. Short story about my background: I studied design at a number of different colleges and universities from Detroit to NYC. I began my design career in the mid 70’s; the beginning of computer typesetting where artwork was prepared using rapidograph pens, Xactos, photostats and hand done mechanicals. There is a LOT to be said for the fabulous resources and possibilities of today’s graphic design. My experience has included ad agency design and art direction, owner of several graphic design firms, freelance design, commercial printing sales and print services buyer. INK IN THE BLOOD I was interested in the process of letterpress and looking for a creative venture where I could use my design skills and love of color. I began to think about a local printer I met about 10 years ago who had a print shop in my town. On a whim, I stopped in one day and asked Dan Dewechter, the owner of Constitution Press, a 120 year old, continuously operating print shop, whether he had any letterpress equipment he was interested in selling. As luck would have it, he did. In fact he was consolidating and liquidating much of his shop having decided to explore other career options. 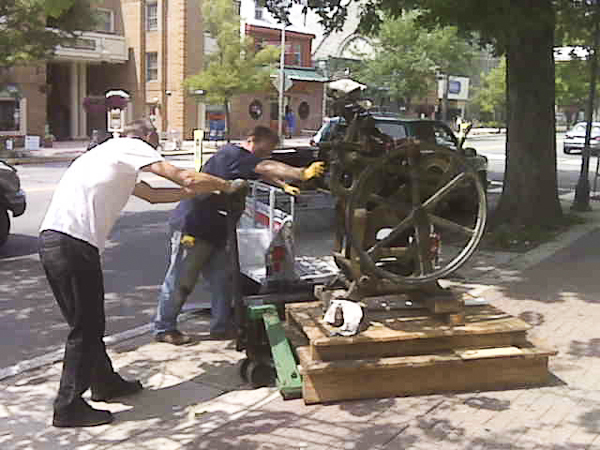 That is where I first met my circa 1916 Chandler and Price 8 x 12 press, all 1250 lbs of iron. Along the way I also contacted Alan Runfeldt of Excelsior Press in Frenchtown, New Jersey. Interested in more hands-on-printing experience, I signed up for a day-long class with Alan and had a blast printing on a variety of presses. FLOURISHING IN THE GARDEN STATE I am currently set up in a small garage studio. I hired some renovation help and we painted, insulated, refreshed and reorganized the space 6 months ago and now it is much more aesthetically pleasing as well as energy efficient. I am looking to expand my capabilities by purchasing another press by the end of the year. 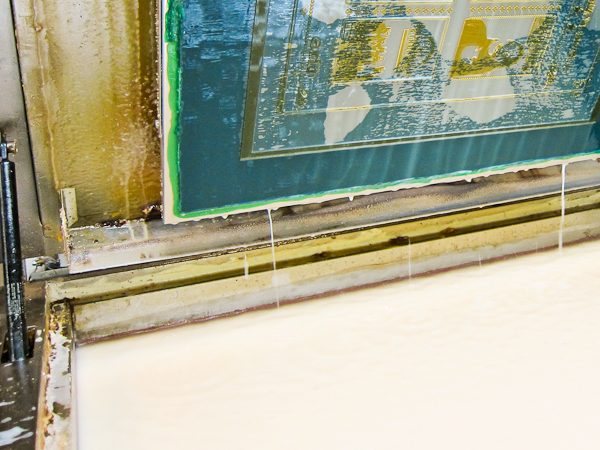 PRINTING LEGACIES As a printer for over 30 years, Dan Dewechter has a wealth of knowledge and experience that you can’t find in a textbook. He not only worked with me, but also gave me pointers and patiently explained the idiosyncrasies of the process. He was generous with his time, talent and skills and is the person to credit or blame for what I ‘m doing now — right, Dan? DESIGNED FOR PRINT I design and print. Currently, I am continuing to add to a line of greeting cards, notecards, and soon-to-come calendars. It’s been an adventure exploring the techniques and mechanics of letterpress printing. I have just scratched the surface of custom work and have collaborated with clients on custom pieces which has been extremely rewarding and a ton of fun. 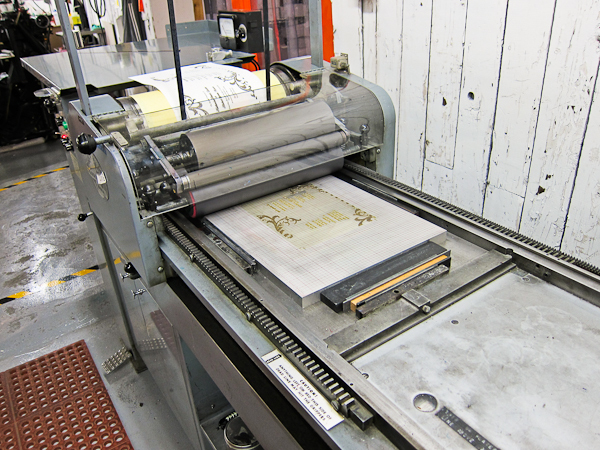 PRINTING FEATS Letterpress printing is a beautifully complex yet simple process. I love the colors, the feeling and the fun exploration of papers and technique. I’m not really sure I’d call it “my life’s work”. I really like it and I’ll see where it takes me. BOXCAR’S ROLE It was Alan who suggested I check out Boxcar Press to purchase plates as well as acquire more knowledge of the letterpress industry. 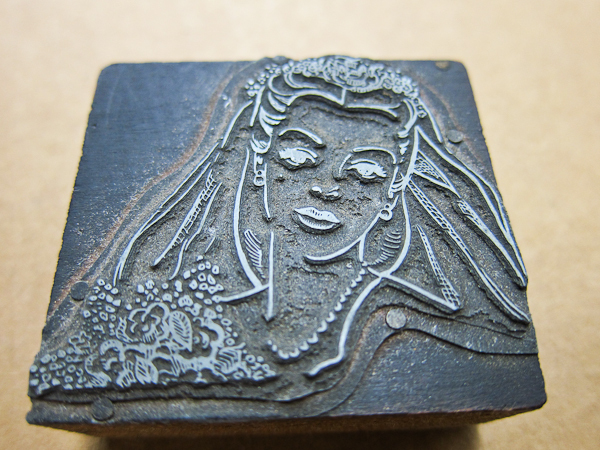 Frequently posted videos and industry information on the Boxcar website has deepened my letterpress education. All of my plates are ordered through Boxcar Press and they have been an excellent, reliable resource for me. GETTING STARTED When it was time to get my press, I contacted Dan, rented a trailer, asked my engineer husband to check out the situation and set the moving date. When I arrived to pick up the press (haha- that’s a good story there) the fun began. (see the pictures) Dan was invaluable and incredibly generous in helping me get my shop set up. Along with the press he gave me just about every possible piece of equipment needed to get started and in fact things I didn’t even know I needed. Seriously. He included quoins, 3 C &P chases, furniture, sets of guides, large roll of tympen paper, packing sheets, extra set of BRAND NEW rollers still in their box, cans of pre-mixed pantone ink colors, press wash, large “stone” on which to lock up the base, roller puller tool, sticky finger goo and stacks of different types of paper to get me started. And more. And he helped move the press. Dan was amazingly helpful and I like to think he was happy to see the press go to someone who would work it and not sold as scrap. WHAT’S NEXT My plans for 2012 include adding a new press to my shop, working with more custom clients and continuing to create new pieces for the Paprika letterpress + design line. My retail outlets include stores in Charleston, South Carolina, New Jersey, Philadelphia, and other areas of Pennsylvania. My cards have been featured in Culture Cheese Magazine and soon to be in USEF’s Equestrian magazine. In the future I’d like to grow the Paprika Letterpress brand specifically within the specialty retail and hand-made-art market nationwide. 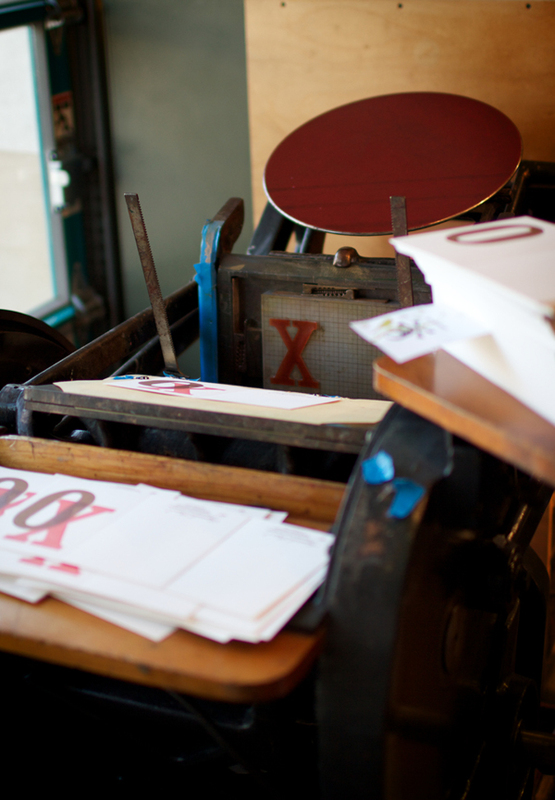 Many thanks to Lenor for letting us take a look into the wonderful world of Paprika Letterpress + Design! Is there anything Elizabeth Rittmeyer and Kelsie Zimmerman can’t do? 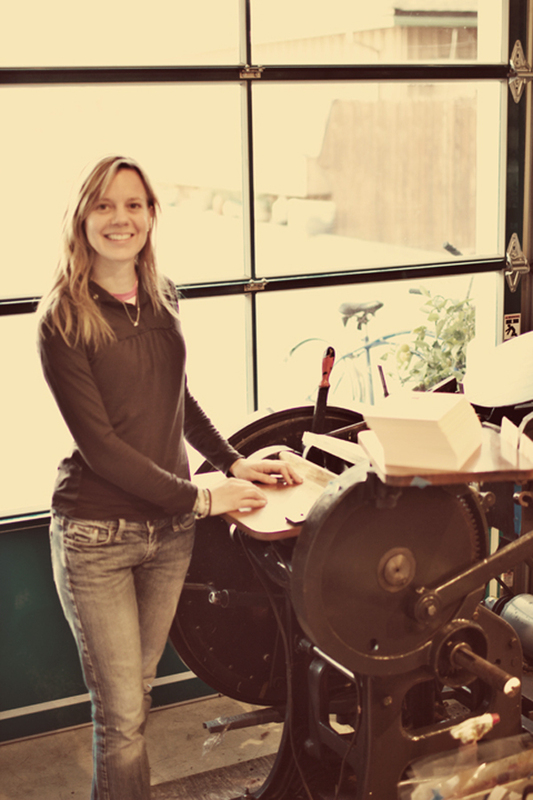 The energetic Elizabeth finally sat down with us to spill the details on just how ambrosial letterpress life at Sugarcube Press can be. 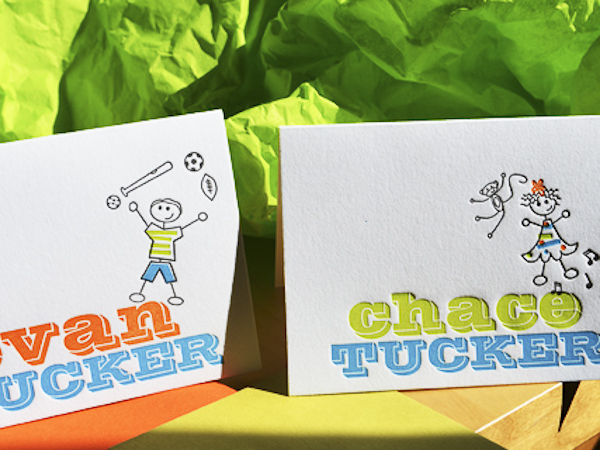 SUGAR, SPICE & EVERYTHING PRECISE I’m a 95%-self-taught letterpress printer, been doing it for 16 years. I’m a Portland, Maine transplant to SoCal via Seattle (I gloat profusely about living in the coolest places). The entire family is back in Maine so my husband and daughter go for 2 months and I get one before the printshop needs me back. I’m over 21, vegetarian 19 years, have a rational and hyper-creative husband who independently designs bags and i-gear for other companies like NAU and Apolis and he does production in Vietnam 4 months of the year (thus I become uber-super-mom). Our 11 year-old daughter is also so creative that she gets up at 6:30 a.m. to write stories before school. I love squirrels, pre-1900 books, tiny cut glass s&p shakers, ‘50’s odds-n-ends for my 1951 house with round livingroom, thrift stores and side-of-the-road finds, my proudest being a fire-orange Danish chair with swooped teak arms. INK IN THE BLOOD In 1995 I moved from Portland, Maine with my husband to a little rural island off of Seattle; he got a sweet job in K2 Snowboards. Well, after one trip on the ferry (after I missed the first two), through Seattle traffic, I decided there was just no way I could commute to Microsoft every day. What’s a girl to do on a wooded island with one blinking red light? Be the coffee-girl at a café. Lucky for me Jennifer and Ron Rich of Oblation remembered me from a book fair and asked if I wanted to be their paper-maker, which I did until I learned to print (enough) to be their printer for 2 years. With their success they left for Stumptown and I stayed on my island and did online weddings only. Looks like I was hooked. CALIFORNIA DREAMING We recently moved to a new space in our sweet little Ojai downtown, a 6-minute walk from my house. We have 800 square feet with softly glowing buttercream walls, two all-windowed garage doors facing directly East with view of the mountains and with the doors fully-open we’re virtually “outside”. 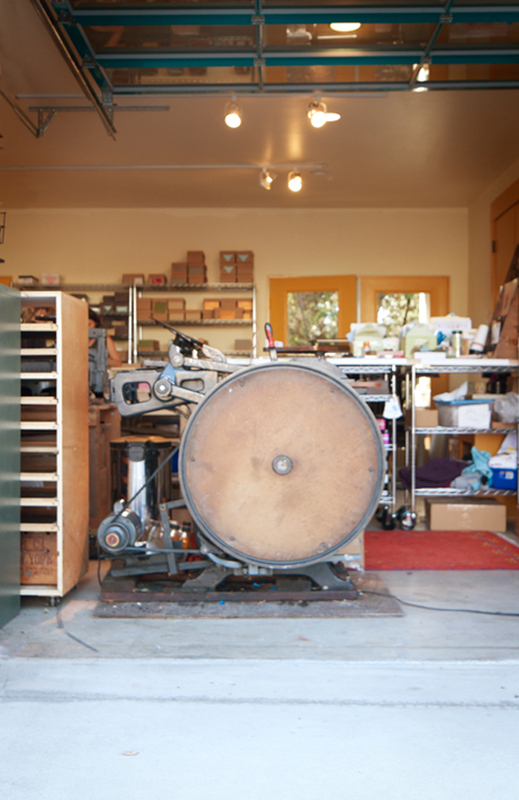 Kelsie has a design-center, we have a processing + shipping area, and a near-half is the print shop. I am the second owner of my 1956 8×10 C&P named Dwight (she’s a girl), and 10X15 Heidelberg named The Butterfly that was bought from Frank Boross of Toxic Coyote Press (he had her for 25 years). Jack, my leggy Chihuahua mutt pound-dog, guards it all. 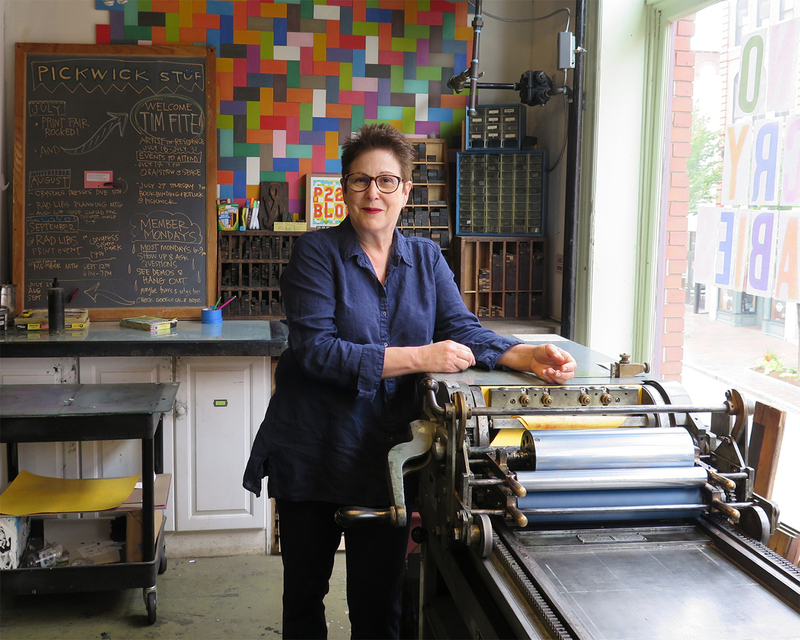 PRINTING LEGACIES I love Bonnie Thompson Norman of The Windowpane Press in Seattle. 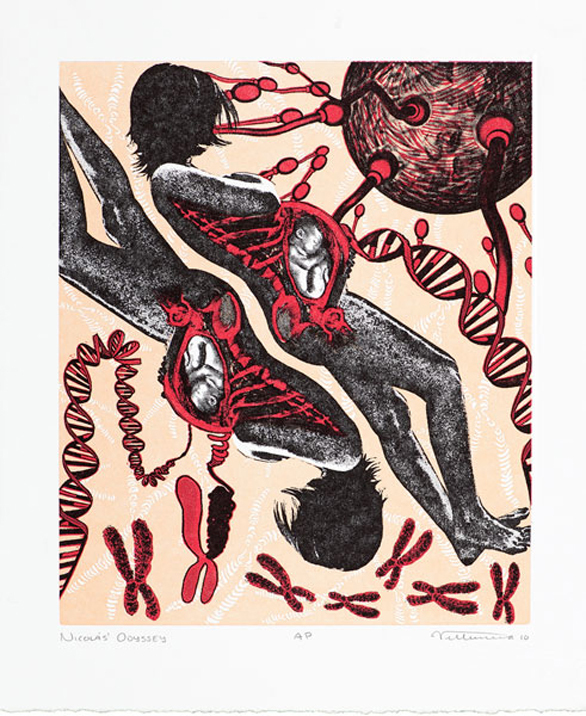 Her books are letterpress and lino-cuts; I adore Madeleine Zygarewicz of Panorama Press, she’s a doll; and I get really happy looking at 9SpotMonk, I gravitate to overlays and splash. Though I am amazed at people who achieve tight-registration and I totally bow to them, I prefer “movement” with overlays and juxtapositions that create new colors. DAILY GRIND “Design” happens every day; it’s inspiration and whimsy from a thrift-store goody or a conversation with a pal. My humor tends towards sarcasm and irony, so our cards are pretty funny. I like the one-offs and tongue-in-cheek play with words we English grads live for. These days I do quick pencil sketches and collaborate with my partner and designer-guru extraordinaire Kelsie Zimmerman; she uses our sketches and ideas and gets them plate-makin’ ready to send to Boxcar. DESIGNED FOR PRINT I’ve always been a “designer” in the sense I draw, collage, carve, arrange and conceive. 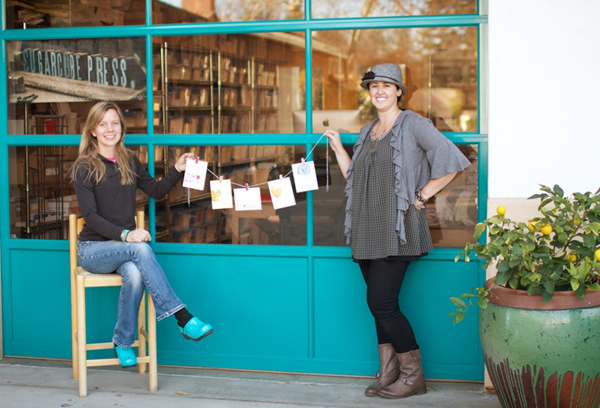 Up until I met Kelsie in 2007, I was the solo-business owner and designer. 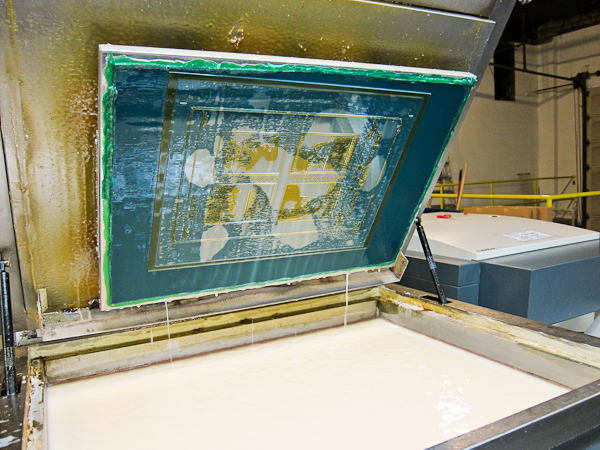 Our collaboration allows me to concentrate on Sugarcube’s printing; I print every single thing that comes out of the shop to supply over 400 stores. FULL TIME FUN I work full-time for Sugarcube Press and thankfully, finally, for no one else! Every-other year I’d panic and go get a desk job. But this past year was sweet to permanently be at my cast-iron “desk” all day; now I stand at the C&P for a solid 5 hours before it gets too tiring, then it’s off to other necessities: packaging, shipping, calling on invoices, and brainstorming. PRINTER’S PARADISE In general, being a printer of good caliber; I print every single card and ephemera from Sugarcube Press on the C&P. Sugarcube has grown exponentially thanks to my go-getter-never-say-I-can’t partner, Kelsie. She rocks! We are both really proud of our growth over the years. BOXCAR’S ROLE Our first NSS in 2008 found us paying thousands of dollars for wood-mounted metal that due to a changed formula (later discovered) was crumbling away as I printed. I was freaking out! We met with Boxcar at that show and decided to make the change to polymer plates: lightness in shipping, less cost in ganging–up images, less hazardous waste in it’s making, and polymer doesn’t smash (whoops) like magnesium. PRESS HISTORY I found my first press, named Big ol’ Pearl, a 10×15 1890’s C&P, in the Printer’s newspaper, in 1997-ish, in PDX. Drove down from the island in a huge Ford truck and extra-long Uhaul. Really spendy ferry ticket. My driver, backing it up in a rain-sodden field, became mired in the mud 500 feet from my studio door. One guy suggested we dump the press in the muck and drag it! The other guy (hello, Einstein) pointed out the press, being in a trailer, was already on wheels, we just needed a come-along, and a few hours of cranking got her inside with nary a drop of rain on her. SHOP TIPS If you want to grow, get a partner! Kelsie and I both do different jobs and our expertise is necessary for our success. She designs and does all of the layout and haggling to get our catalogs done, online pop-up sales, keeps reps happy and trade shows looking sweet. I’ve mostly got the printing and stock under control; ya gotta make it to sell it! WHAT’S NEXT Making more of everything and tripling growth. 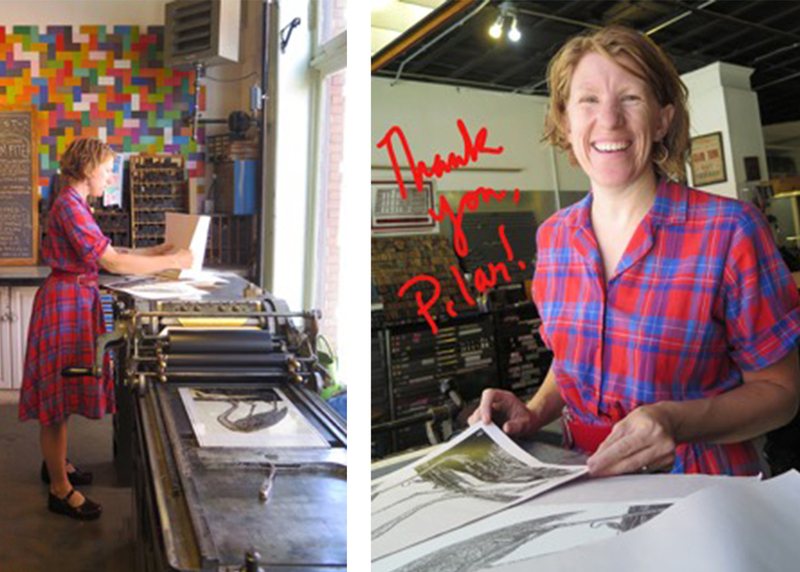 Big thanks to Elizabeth and Kelsie for showing the sweeter side of letterpress with Sugarcube Press! Check out their nifty videos here! Did You Know That … Checking Line and Dot Thicknesses Is a Cinch? One of the most common issues we face here in the Platemaking Department at Boxcar Press is determining a sufficient line thickness. Making that ruling means explaining to customers two things – how do you go about checking to see if lines or text are thick enough to hold on your particular plate? What’s the thinnest line that can hold on the plate? 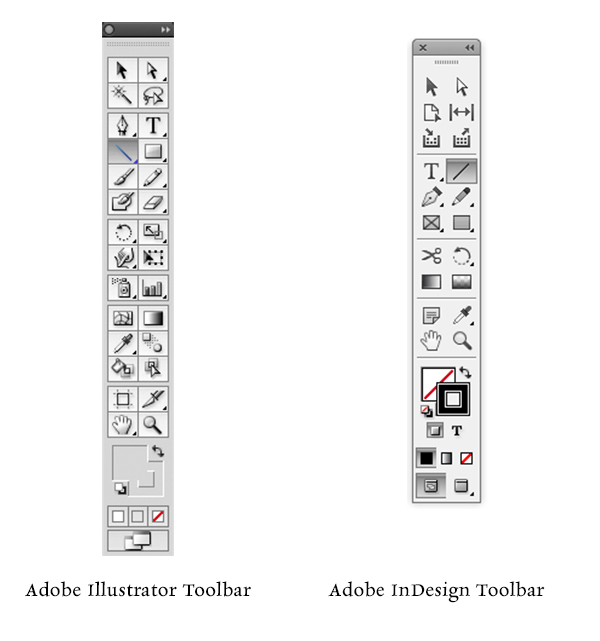 Surprisingly, there’s just one tool you need to utilize in either Adobe Illustrator or InDesign: The Line Tool. If you are using Adobe Photoshop, the Line Tool unfortunately reverts to a minimum line thickness of 1pt. If you are only using Adobe Photoshop to create your file, we highly recommend placing your final file in InDesign and using the Line Tool to check your work. What do we mean when we talk about our line thickness guarantee? Simply put, if your lines meet or exceed the line thickness as outlined below, we will guarantee they will hold on your plate. If they are under that thickness, it’s hit or miss. Some days you are lucky and other days, you might lose details. – If your plate type is the KF 95, Jet 94FL, or 94SB, you have a line thickness guarantee of 0.25pt or thicker. – If your plate type is the KF152, 152SB, or 145SHSB, you have a line thickness guarantee of 0.35pt or thicker. – For all plate types, your dots (like the ones above the letter “i”, periods, or dotted lines) must be 1pt to 1.25 pt or thicker. THINK FAST! Quick quiz here – what is usually the most common culprit of too thin lines? Crop Marks! More on that later. You need to first open your file in either Adobe Illustrator or InDesign. We’ll be using a small type sample in Adobe Illustrator to check to see if our lines are plate-friendly for a KF152 plate type. The KF152 plate type has a line thickness minimum of 0.35pt for lines and 1pt to 1.25 pt for dots. 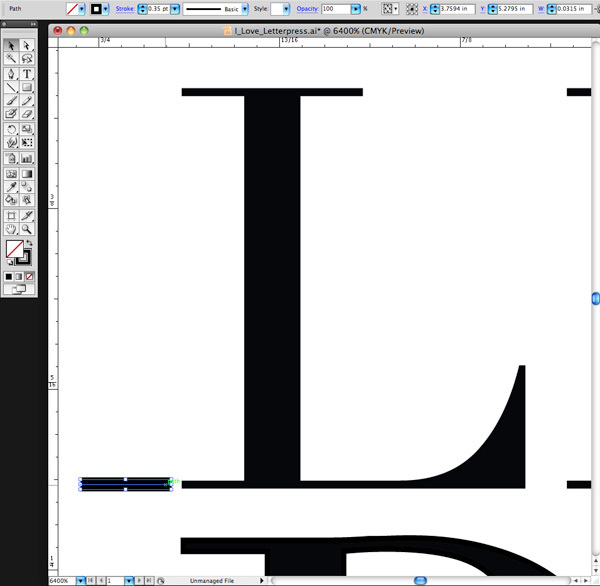 We can see that it looks like there are some thin lines in the serif of the Didot typeface… but will they hold? First, click the Line Tool icon in the tool palette on the lefthand side of the screen in Adobe Illustrator to activate it. If you cannot find it, hover your mouse over the icon that looks like a line to see “Line Segment Tool ()” pop up in a yellow box . Next, in the control panel up at the top, we’ll select the words “1 pt.” in the dropdown area next to the word “STROKE” with our mouse. You’ll be substituting the “1 pt” and replace it with “0.35pt”. We’ll select the Zoom tool (Z) and move in because we’ll be doing some close up viewing in the area you are inspecting. Select the line segment with your mouse and move it so it is right next to the bottom part of the “L” in “Letter”. Draw a short line so it is parallel with the thin line you are checking on your art board. It doesn’t have to be very long but this little line segment will be our “ruler” to compare thicknesses. At this close magnification, we see that our line segment set at 0.35pt is much thicker in comparison to the thinnest line in of the serif on the letter “L”. We will need to add a hairline stroke to boost our text’s thickness to correct this. To add a stroke, using the selection black arrow tool (V), select all the characters in the word “LETTER.” In our Control panel at the top our screen we should see that the letters only have a fill and that we’d like to add a hairline stroke (about 0.15pt). Click the white area next to “STROKE” to activate the area so we can type in “0.15pt”. Immediately single-click the white area anywhere on the board. This will deactivate your selected text and add the hairline (0.15pt) stroke. 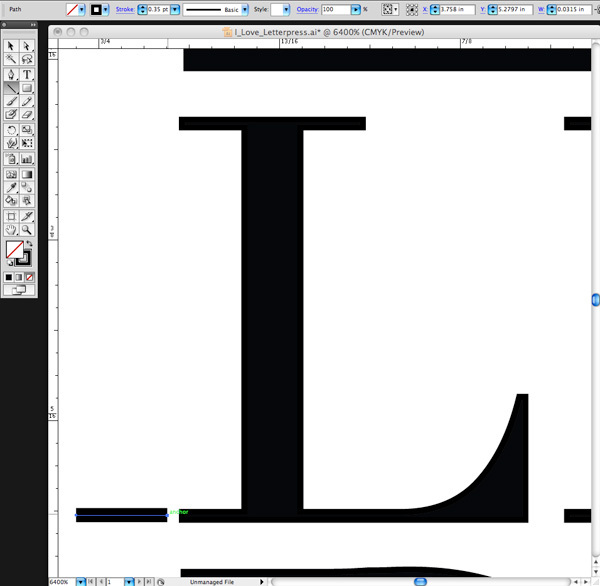 Zoom in again using the Zoom Tool around the line segment we created with the Line Tool and the letter “L”. We can now visually see that the serif on the “L” is as thick as the 0.35pt line. Success! Delete your line segment and zoom back out. Continue around your artboard to visually check to see if other areas look “safe” as well. For dots, such as the ones around the heart shape, we’ll need to set our Line Tool weight to “1pt” just to be on the safe side. We’ll repeat the same steps mentioned above to create the line, to zoom in, and visually compare the dots’ diameter against the 1pt line segment we just drew on our art board. Like the thinner lines on the “L”, we’ll need to correct this by adding a much thicker stroke of 0.3 pt to boost our dots’ diameter up to 1pt. Using the Line Tool to check your work should be a “Must Do” test before submitting your files to your platemaking ticket. If anything appears too thin, you will need to correct it. -When creating crop marks in your files – the program default setting is often 0.2 pt or 0.25 pt. Keep this in mind so you can make the necessary changes to your crop mark thickness when you place them. -Thin lines that curve, particularly in wispy script or calligraphic fonts, are always suspect for being too thin. Give them the support they need to hold on the plate with hairline stroke (if needed). Stay tuned, letterpress lovers — next we’ll solve the mystery of how to create multiple color files! Did You Know That … 100% CMYK Black Is a Breeze? Greg peels a plate off the washout unit on the platemaker. 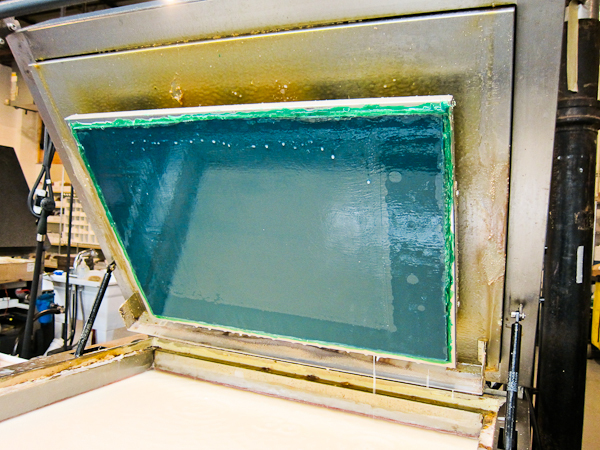 In the water are brushes that have taken off non-inking areas of the plate. Here is a piece of Harold’s metal cut ( or illustration ) collection: A bride in classic form. 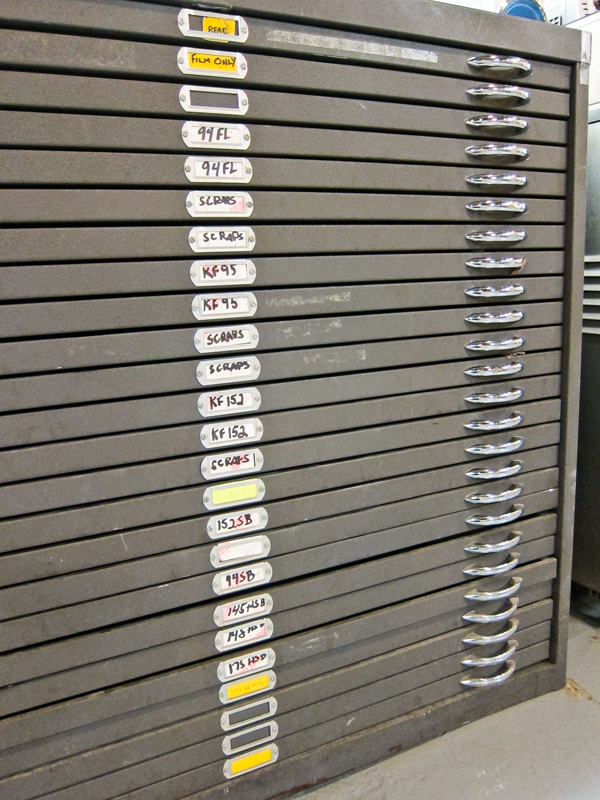 Inside this formidable cabinet lies a plethora of plate types that one can order from us. You can choose metal or plastic backed, and a variety of plate heights. Today’s job is a double-sided trifold wedding program. This lovely classic piece is printed in taupe ink on white Smock bamboo paper. Next the program will go on to be scored for smooth folding. Then it will be trimmed, inspected, packed and shipped to the happy couple. That makes us happy.